Intersections are areas where roads converge and traffic crosses paths. Intersections usually allow vehicles to go either three or four different ways, although there are also intersections that allow for travel in five, six or more directions. The drivers who meet in an intersection must share the road, yield to other drivers and obey traffic control signals to avoid car wrecks. Drivers don’t always do what they are supposed to at intersections, and not all drivers who come to a crossroads are careful. When a driver makes a mistake or disobeys traffic laws at an intersection, a serious accident can result. These accidents can cause severe injuries. They can also raise many legal questions, especially if it is difficult to sort out who made the mistake that caused the accident. If you or someone you love was hurt in an intersection crash, it is important to get to the bottom of who was to blame. It is also important to understand your legal rights and to take action against a driver who caused the crash. 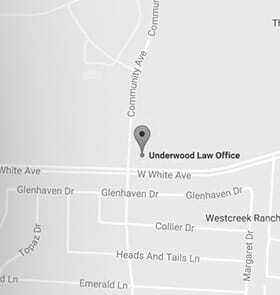 At Underwood Law Offices, our car accident lawyers have extensive experience handling intersection collision cases. Contact us today to learn how we can assist you in making a claim for damages. The National Highway Traffic Safety Administration (NHTSA) indicates that around 40 percent of all car crashes happen at intersections. These accidents typically occur when one or more drivers disobey the law or make a mistake. Inadequate observation was the leading cause of intersection crashes. In 44.1 percent of car wrecks at intersections, the accident happened because one or more drivers simply didn’t look or didn’t see other cars, motorcycles, pedestrians or bicycle riders in the intersection. Faulty assumptions caused an estimated 8.4 percent of intersection crashes. When a driver makes the wrong guess about what another car will do, this can result in a crash. For example, a driver might wrongly assume that a vehicle approaching a yellow light is going to stop. Obstructed views were a factor in 7.8 percent of accidents. Drivers entered intersections despite not being able to see other vehicles coming, and a crash resulted. Driver distraction was a contributing factor in 6.7 percent of intersection accidents caused by driver behavior. Drivers misjudging other vehicles was the cause of 5.5 percent of intersection accidents. For example, drivers may have incorrectly judged the speed at which an oncoming car was traveling. These are some of the top causes of intersection accidents identified by NHTSA, but they are not the only causes. Drivers make all kinds of careless decisions every day. When those bad choices are made at intersections, it is a recipe for disaster. Problems with the design or maintenance of an intersection and its traffic-control devices can also contribute to car crashes, as can vehicle defects. While any type of accident can occur at an intersection, T-bone crashes are especially common due to cars converging from different directions. Also called side-impact collisions or broadside accidents, these crashes commonly happen when drivers fail to yield at intersections. Side-impact accidents at intersections are also very likely to cause serious injuries. The sides of a car cannot crumple and absorb the energy of a crash like the front and rear structures. Severe injuries from an intersection accident can result in expensive hospital bills, missed time from work, a reduced quality of life and the need for ongoing medical or supportive care. The driver who was responsible for the intersection accident should compensate the accident victims for injuries caused by the crash. Who is To Blame for Intersection Accidents? It can be difficult to prove who was to blame for intersection crashes since there may be many vehicles at the intersection coming from different directions. Law enforcement will generally attempt to determine what caused the accident when writing an accident report, but statements from witnesses and from accident reconstruction experts may be required to get to the bottom of the actual cause of an intersection crash. If you or a loved one was hurt in an intersection accident, you will need help gathering the evidence you need to prove fault. An experienced car accident attorney at the Underwood Law Offices can assist you every step of the way, from getting evidence from the police to interviewing witnesses and putting together a strong case. At Underwood Law Offices, our dedicated car accident attorneys have extensive experience investigating intersection accidents and successfully pursuing compensation for victims. We can help you gather evidence to prove who was to blame for your accident. We can also help you demonstrate the extent of your injuries.